It was a year of two halves for the listed commodity traders and palm oil plantation firms. But while the light at the end of the tunnel remains unclear for mid-stream traders, plantation stocks are set to ride on rising crude palm oil prices. Even as the benchmark Straits Times Index (STI) climbed upwards in the first half of 2013, shares for the largest commodity trading firms in Asia - Noble Group, Olam International and Wilmar International - slumped. Only in September did more upbeat market sentiments and a recovery in the prices of some commodities such as sugar, together with positive third-quarter results at Noble and Wilmar, give a boost to their share prices. Still, Noble will end the year as one of the worst performers on the STI for the third year running, its price having fallen 8.23 per cent this year compared to the STI which dropped by a smaller 0.55 per cent. "The mid-stream trading companies have performed poorly for most of this year as they had to deal with challenges related to past diversification investments. Noble's and Olam's results have been especially volatile," said Macquarie analyst Conrad Werner. Noble had invested in Brazilian sugar mills in 2010, which returned to the black only in the latest quarter. Olam has trimmed its capital expenditure and is looking to sell stakes in some of its assets to release cash from its balance sheet. The muted economic outlook in the first half of the year also kept investors away from them, said OCBC Investment Research analyst Carey Wong. But with a US economy on stronger footing, investors could adopt a more "risk on" approach, he opined, upgrading his call on the sector to "neutral" from "underweight". "With the valuations of some of the commodity plays still looking relatively inexpensive, we could see potential upgrades for some of them if there is an over-correction in the market," he said. Of the three stocks, Wilmar is by analysts' consensus the top pick. Soybean crushing margins in China, which dragged down the group's performance in the past two years, are stabilising, and the current low crude palm oil prices will also benefit Wilmar, said Maybank Kim Eng analyst Wei Bin. Phillip Securities analyst Nicholas Ong also chose Wilmar for its exposure to emerging markets, such as China, India and South- east Asia, and resilient vertically integrated business model. The stock is a good proxy for the growing food demand in Asia, he said. But Macquarie's Mr Werner cautioned that next year is likely to be a tough year again for the three traders. "We will have an over- capacity issue in agricultural products. Because they're more exposed to the processing and upstream side than in the past, lower prices affect them more," he said. It will also be "a slow arduous process" for the firms to demonstrate that they can consistently manage their assets better, and bring up their returns to equity, he added. "For Noble and Olam, they should be getting mid-teens returns. They're around the 10 per cent mark right now." In the palm oil sector, Golden Agri-Resources also joined Noble in the ranks of the worst performing stocks on the STI this year, with its price down 16.9 per cent. Share prices for palm plantation firms such as Golden Agri, First Resources and IndoFood Agri had similarly fallen before picking up in the second half, following the trajectory of crude palm oil prices. Analysts are positive on the sector, on expectations that higher biodiesel mandates in Indonesia and lower palm oil inventories will lift crude palm oil prices next year. CIMB and Citi Research forecast that crude palm oil will hit RM2,700 (S$1,040) per tonne next year, up 12.5 per cent from the average this year. But this will be capped by rising supplies of oilseeds such as sunflower and soy oil, and lower demand for biodiesel in the US and Europe, said CIMB. Rabobank also warned that the implementation of biodiesel programmes in Indonesia and Malaysia remains uncertain. "Undoubtedly, biodiesel programmes are among the strongest bullish driver for palm prices in 2014, but delays in implementing these mandates and a decline in crude oil prices could dampen the impact of these programmes and reduce bullishness," it said in its outlook for agri-commodity markets in 2014. 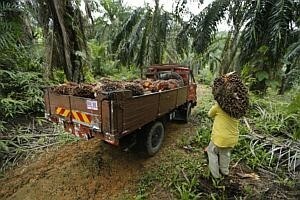 The bank is neutral on palm oil prices. First Resources and Wilmar are analysts' favourites in the palm oil sector, for their young estates and strong business model respectively.